Well hello and welcome to you my dear reader and another new follower to my blog who's name I only know as the Nutty Naturalist. Glad to have you aboard and I hope you enjoy the ride. The other moth was a Mullein (Shargacucullia verbasci), but it was a bit eager to get away and I couldn't get it settled. So rather than the poor thing beat itself senseless in a jar, released it before getting any decent pictures. Lets hope I get another one that isn't so fired up. Of course, the trap not only traps moths, but it also managed to attract not one, but four Ichneumon wasps, possibly Ophinion sp, but as always so very hard to tell. 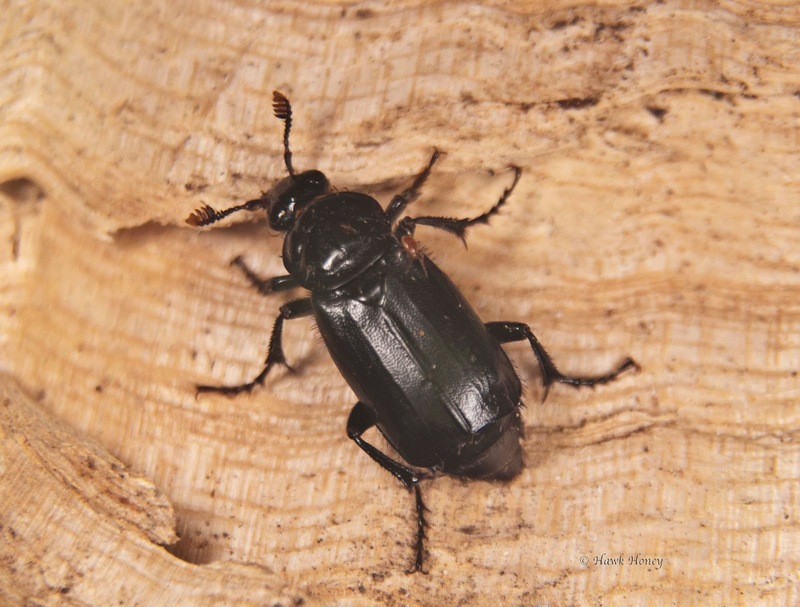 The other non-moth guest to the trap was a beetle, a burying beetle called a Black Sexton Beetle (Nicrophorus humator). As it suggests, it likes to bury under small dead creatures such as mice, voles birds etc. Then once underneath, it creates a shaft and pulls the carcass down into the shaft, then lays its eggs on or near the body so that the emerging larvae are well provided for when they hatch. This beetle also emits a foul smelling stench of rotting flesh, which made photographing it an arduous task. Nicrophorus humator and a little buddy. Looking closely at the above photo, you will see not only the beetle, but on his right elytra at the top you will also see a small brown mite. These are common on some beetles and I've even seen them on bees. This beetle had about 6 of the little fellows on him hitching a ride, mainly clinging on underneath. They always give me a shudder when I see these. I remember once doing a bat survey on a barn and lying on the floor was a Violet ground beetle which was absolutely covered in mites. So much so, it could hardly move, poor thing. 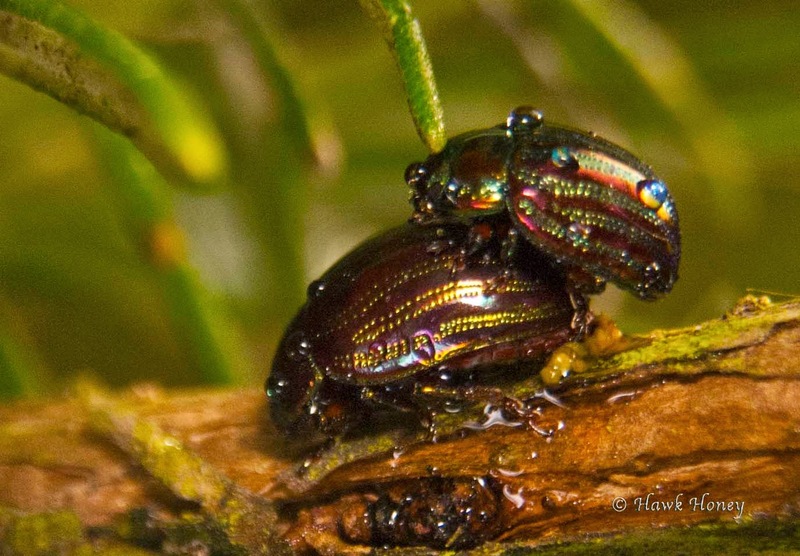 Still on the subject of beetles, but a much prettier looking one was this couple I caught getting jiggy with it. As you can imagine, this beetle is found on the Rosemary plant and is a prolific pest to growers of not just rosemary, but lavender, thyme, sage and other related plants too. Even worse, it's not a native species either and it originated from southern Europe, only finding its way to the UK in the early 1990's. Now it's widespread across much of the UK. It's not so much the adult beetle that does the damage, more its larvae which just like to eat the plant itself and my poor rosemary really is looking the worse for wear. 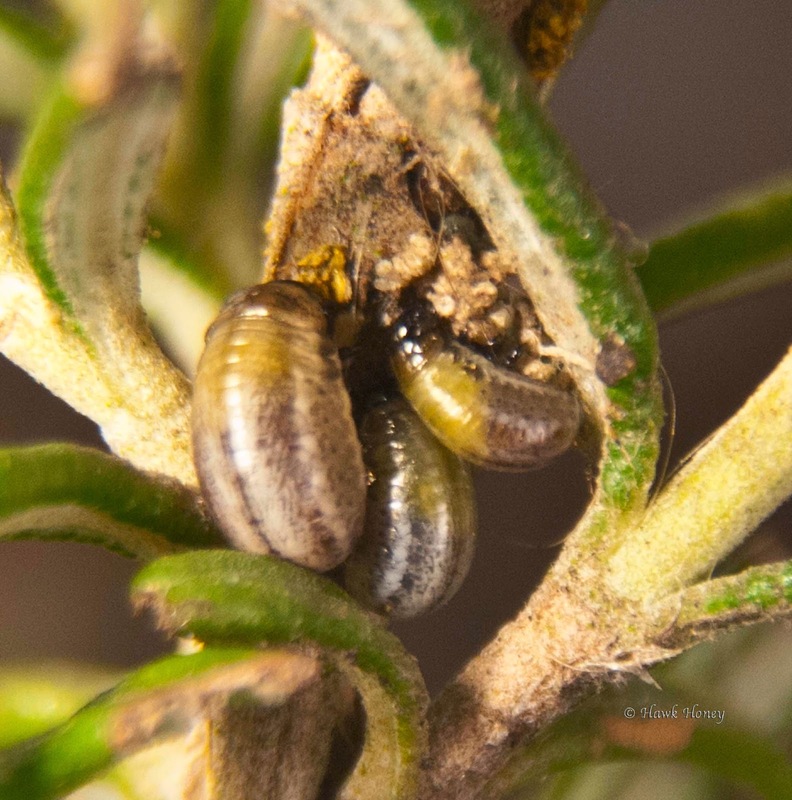 The destructive larvae of the Rosemary beetle. Lots and lots of eggs. Well there was no way I was going to be able to feed an army of caterpillars that size, the sixty odd I had last year was hard enough to keep up with. So, some other willing and like-minded friends (Helen & Julian) had some and I kept some for myself. The rest I took to the heath and carefully placed them in various areas spread across the heathland. 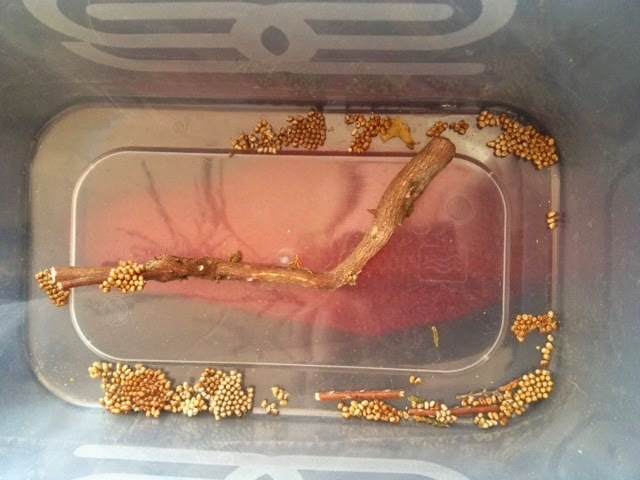 As for the ones I kept myself, well they've hatched and at only a day old, they've wasted no time whatsoever in getting down to what a caterpillar doe best, eat! Last time, some of you had trouble seeing the video link to my site (that was 'Blogger's' fault not mine) and again if you can't see the video above, then click this and the magic of the internet will whisk you straight there. the little mini munchers have started tucking into bramble leaves and fresh pear leaves, they seem to prefer the later however, as you will see in the above video. 3 little eggs as of the 1st April. How exciting! What's even more amazing is that the nest is left unattended all day long with only the occasional visit to bring back more nesting material. Yet, I always imagined the eggs would needed to be kept warm and incubated. We'll just have to see what happens. Don't forget dear reader, that you can check in on my YouTube channel at anytime to see any videos I've uploaded and feel free to leave any comments either here on the blog or on the channel. 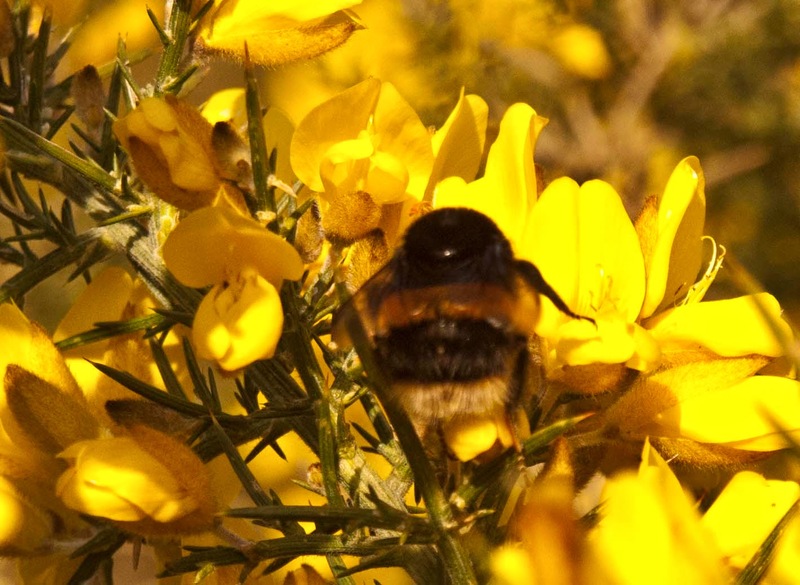 That's it for now, I'll just leave you with one more image of the week, a Buff-tail Bumblebee (Bombus terrestris) feeding on some gorse on the heath. Till next time dear reader, keep safe, keep smiling. Lovely blog,, as always. I love the beetle pictures - my sister-in-law breeds insects and spiders as part of a programme to protect native and rare species. 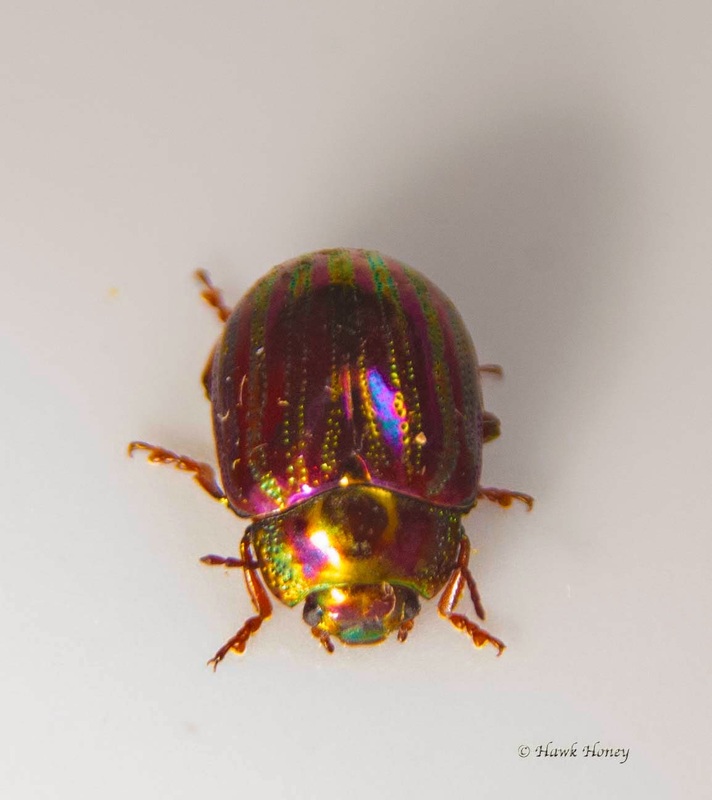 Until she showed me her work, I didn't realise that beetles were such lovely lovely colours.